Perth - A View from Space: Stereo Aids - Manufacturers of Mirror and Pocket Stereoscopes. Publishers of 3D Imagery. A High Quality Spot Satellite Image! Residential (older and newer), Commercial, Industrial, CBD, Public Open space, Market Gardening, Transport and other special uses. This image is an excellent way of studying and comparing the urban morphology of a major Australian city. Scale: 1:100 000. 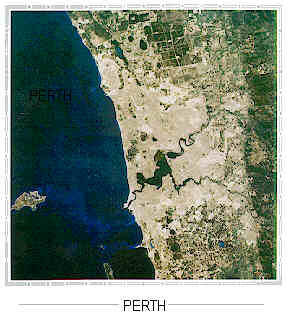 This can be compared to the same scale maps to see the growth of Perth. Finish: The image has a high quality gloss finish which is also hard wearing.